Please Save the Date for this year's annual Clearing the Path Gala, which will be held at the Fairmont Hotel in Washington, D.C. on Wednesday, October 26th. We will be celebrating 19 years of successfully helping war-torn countries become safer places for people to live & work and providing assistance to hundreds of landmine survivors. For more information on reserving your table and finding out about opportunities on becoming a Gala sponsor, please contact Tycie Horsley or call us at (703) 243-9200. The conflict between Azerbaijan and Armenia during 1988-1994 left both countries littered with landmines and explosive remnants of war. Currently, around 35,000 people in Armenia and approximately half a million in Azerbaijan are directly impacted by landmines. These deadly killers have inhibited entire communities from living and traveling safely, and continue to pose enormous barriers to economic development. Armenia and Azerbaijan have suffered devastating effects from the conflict and MLI proudly supports landmine removal operations in both countries. We have provided thirty six dogs to Azerbaijan since 2005. These MDDs, working with the Azerbaijan National Agency for Mine Action (ANAMA), have searched more than 25 million square meters of land - or more than 6,100 acres! In 2002, MLI received a request to help support and expedite Armenia's indigenous demining efforts, and we immediately responded by donating 12 MDDs and training local handlers. These dog teams served with the Armenian Humanitarian Demining Center, "sniffing out" landmines and saving lives before retiring in 2010. Last year, Armenia's Deputy Minister of Defense requested that MLI donate six new mine detection dogs to enhance the demining capacity of the Center for Humanitarian Demining and Expertise (CHDE). In partnership with the U.S. Department of State's Office of Weapons Removal and Abatement (PM/WRA) and in collaboration with the International Trust Fund - Enhancing Human Security and the Mine Detection Dog Center in Bosnia Herzegovina, MLI responded by donating six newly trained MDDs in November 2015. Five of them already have passed internal certification tests in accordance with the International Mine Action Standards! The MDDs will commence working this summer to help the CHDE free the country of the scourge of landmines. Four of the six dogs have been very generously sponsored by private American donors, including schoolchildren! The remaining two MDDs are still looking for sponsors and your help would significantly contribute to a mine-free Armenia. These MDDs, Gizmo and Buck, are two-year old Belgian Malinois who are eager to put their noses to work! These efforts are not possible without supporters like you. You can donate here or contact us for more information on the MDD program in Armenia. in Etchmiazin this week to view the progress of the dogs teams. He said it was the highlight of his week! The Islamic State in Iraq and Syria has killed thousands of people and forced millions to flee their homes. In Iraqi Kurdistan, vast amounts of IEDs (improvised explosive devices) and mines were left behind in areas liberated by the Peshmerga forces of the Kurdistan Regional Government. The Ministry of Peshmerga reports that more than 60% of the nearly 10,000 casualties suffered by Peshmerga forces were attributable to mines and IEDs. In March, MLI received a letter of request from the Ministry of Peshmerga for 16 explosive-sniffing dogs over the next year to help clear liberated areas for the safe return of internally displaced persons and refugees. MLI has agreed to support the Peshmerga request and will send the first dogs to northern Iraq by August 1st along with a senior dog trainer to train local Kurdish handlers. MLI also has been asked by the Mines Advisory Group (MAG) in Kurdistan to replace two of the six MDDs that MLI donated in 2009 and who are ready for retirement in caring, loving homes. MAG has been conducting humanitarian mine action in Kurdistan since 1992, and has been an outstanding steward of MLI's life-saving dogs. Over the next year, we plan to provide 18 MDDs to Kurdistan. Generous private Americans have sponsored the first two MDDs, which will be given to MAG this summer. They include MDD Woody, who is the fifth dog sponsored by CHAMPS kids at Glenelg Country School in MD, and MDD Nam, who has been sponsored by graduates of U.S. Military Academy Class of 1970. MLI currently seeks donors to support the remaining 16 dogs - please consider making a donation today to help the people of Kurdistan! Consider making a tax-deductible donation to support our demining efforts in Kurdistan and Armenia. Your donation will go directly towards the purchase, training, and delivery of mine detection dogs and will create a lasting impact on communities threatened daily by landmines and other dangerous explosives. Since 2005, ATK and the recently merged Orbital ATK have been significant supporters of our programs in mine-affected countries. Last month, Orbital ATK sponsored its FIFTH mine detection dog, which the company has chosen to name Booster, in recognition of the solid rocket boosters it produces for NASA’s Space Launch System (SLS). MLI's work would not be possible without generous corporate donors like Orbital ATK and its VP for Washington Operations, MG (Ret.) Guy Bourn. ATK and Orbital ATK's four previously sponsored dogs include MDDs Duco and Rocket (Azerbaijan), MDD Astro (Armenia), and MDD Leader (Lebanon). The impact of these MDDs is felt daily in dozens of communities in the beneficiary countries. Thanks to the hard work of the MDDs and their handlers, and the support of dedicated sponsors such as Orbital ATK, people are now able to walk, play, and cultivate their land without the fear of landmines. 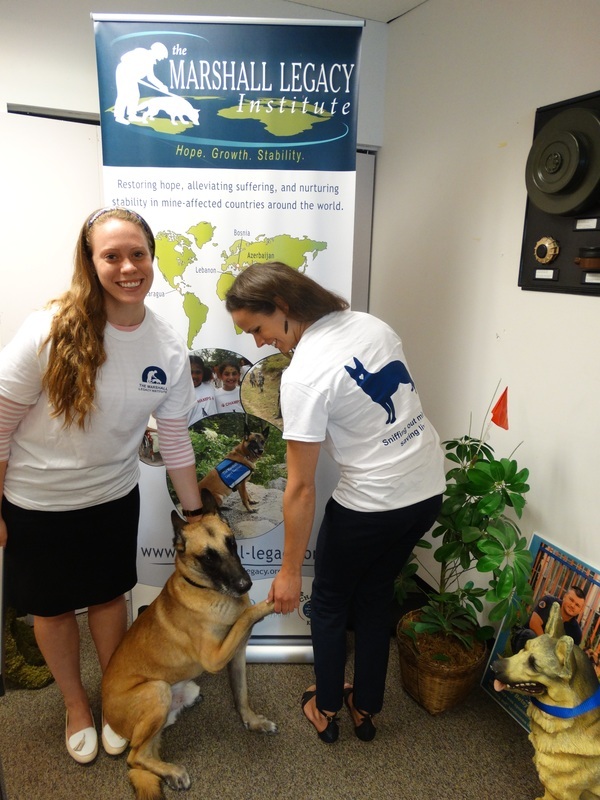 Every little bit helps - you can now join a campaign with other caring humanitarians to help sponsor a mine detection dog! By participating in our Share-a-Dog program, for $21 per month for 1 year, you can have a huge impact on those living in mine-affected communities. To find out more about this incredible program, visit us here. 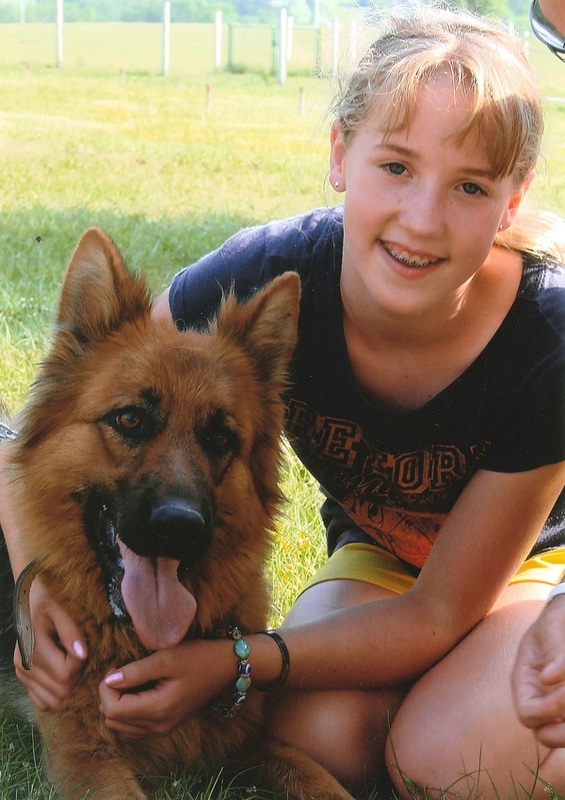 Meet MLI's new Canine Ambassador: MDD Nutmeg! In February of this year, a retired mine detection dog from Lebanon, named Nutmeg, joined MLI's team as our new canine ambassador. MDD Nutmeg spent eight years working hard to "sniff out" landmines in Lebanon with the Lebanese Mine Action Center (LMAC). She was generously sponsored by Kirsten Parkinson and the CHAMPS Greenwich community in 2008, and over the past 8 years she helped to search over 800,000 square meters of land! This land has been returned to the people for safe agricultural use and infrastructure development. MDD Nutmeg now lives with MLI's VP of Children's Programs and Victims' Assistance, Kimberly McCasland, and our CHAMPS Assistant, Rachel. 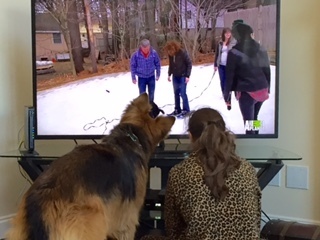 Her favorite past-time is watching Animal Planet, which she is quite passionate about! She also loves playing with children, which is wonderful since her new role with MLI involves traveling around the U.S. to visit schools and help our CHAMPS team spread the word about the great work being done by Mine Detection Dogs around the world! We are very fortunate to have MDD Nutmeg with us - she is a daily reminder of the work our MDDs perform to save and improve the lives of others. Do you want to meet MDD Nutmeg? Contact us to find out more about our CHAMPS program, MDD Nutmeg's live mine demonstrations, and how your school can become involved! 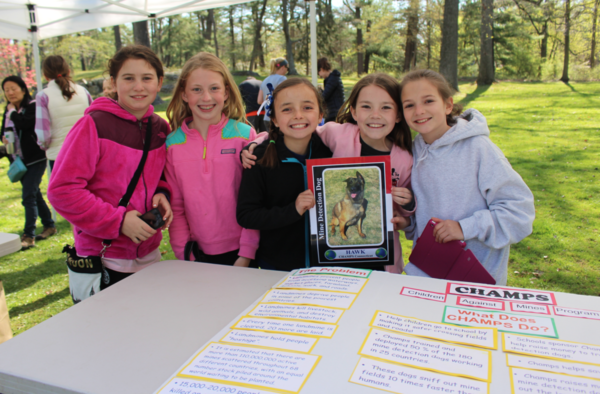 The North Mianus and the Cos Cob School collaborated with the Rotary Club of Greenwich to hold their annual CHAMPathon on April 23rd at Bruce Park in Greenwich, CT. Led by one of MLI's most dedicated teachers, Julie Cafone, and Principal Angela Schmidt of the North Mianus school, this year's CHAMPathon was held to sponsor a Mine Detection Dog names "Emily" in honor of Emily Fedorko, who attended North Mianus School and was tragically killed in a boating accident two summers ago. 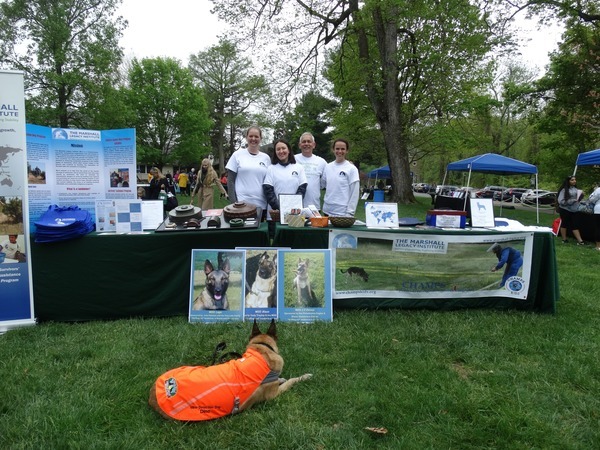 Thanks to the hard work of Julie Cafone and Angela Schmidt, the event was a huge success and completed the fundraising campaign to sponsor MDD Emily, who is a beautiful female Belgian Malinois that is now in training in Bosnia Herzegovina with the Mine Detection Dog Center. We expect that she will finish her training within the next two months and will begin her life-saving work in Bosnia with the indigenous demining organization, UEM, by the middle of the summer. MLI is incredibly grateful to the entire Greenwich community for their overwhelming support and generosity. We extend our heartfelt thanks to the Rotary Club of Greenwich, as well as all of the amazing students and teachers of the North Mianus and Cos Cob schools. For more details about this awesome community and wonderful event, check out this great article from the Greenwich Free Press. 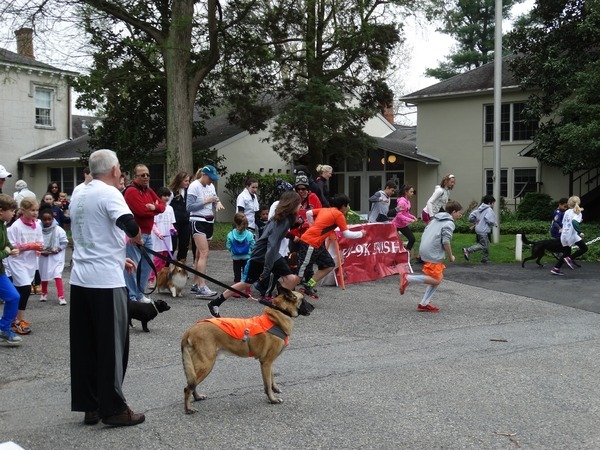 The 6th annual K9-9K Walkathon & Run was held on April 30th at the beautiful grounds of Glenelg Country School (GCS) in Ellicott City, MD. Hundreds of participants braved the chilly morning weather to come out and support MLI's efforts and the school's event that raised more than $10,000 for children who have been injured by landmines in mine-affected countries! CHAMPS students at GCS have sponsored five Mine Detection Dogs through previous K9-9K Walkathons and other fundraising events! Last year's K9-9K sponsored MDD Woody, in honor of Lynda Rotter, a GCS staff member who has just retired. MDD Woody will start working in Kurdistan once he completes training at the Global Training Academy in Texas. Since 2011, CHAMPS students at Glenelg Country School have raised money to sponsor 4 other MDDs: Jason (Bosnia and Herzegovina), Barrett (Iraq), Country (Azerbaijan), and Dragon (Afghanistan). The K9-9K event would not have been possible without the dedicated and enthusiastic GCS teacher, Jennifer Cope, who leads the GCS Lower School's CHAMPS program and whose spirit and tireless efforts have once again made the event a great success! MLI extends its thanks to all of the wonderful faculty, students and parents at Glenelg Country School, as well as all of the K9-9K participants, whose contributions this year will support children who have been injured by landmines. MLI's CHAMPS projects continue connecting American youth with children in Bosnia and Herzegovina and Yemen so they can become friends, learn about the dangers of mines, and work together to help mine survivors. American children have raised tens of thousands of dollars to provide prosthetic limbs for mine survivors, and the U.S. Department of State's Office of Weapons Removal and Abatement (PM/WRA) has continued providing MLI with vital funding to support additional medical assistance for survivors, vocational training, and Mine Risk Education. Below are a few highlights from CHAMPS around the world. Bosnia and Herzegovina: Admir lost his leg in a mine explosion several years ago as he was chopping firewood in the forest with his father. Unable to afford a prosthetic leg that fit him properly, Admir suffered immensely and could barely walk. Found by MLI's CHAMPS managers in Bosnia, Admir recently received his new prosthetic leg, which was funded by schoolchildren in the U.S., and was finally able to walk down the aisle to marry his high school sweetheart, Ida, and dance with her during their wedding earlier this year. He is incredibly grateful to all of the CHAMPS students for helping his dream come true! Yemen: In the past few months, children in the U.S. raised funds to provide prosthetic limbs for ten landmine survivors in Yemen. Additionally, MLI held two vocational training courses to train survivors in carpentry and sewing. The participants of the carpentry course (pictured above), engaged in a month-long course and are eager to use their new skills at local carpentry businesses. Five female survivors also received vocational training in sewing, which has helped them generate income for themselves and their families. ►Please email us at info@marshall-legacy.org for more information about the program and its benefits for children around the world. You can also learn more at the new CHAMPS Zone on MLI's website!